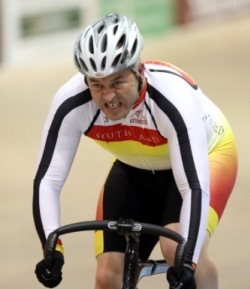 02/03/2011 - Records fell and Southland brought up its century of points on the second night of finals at the RaboDirect National Age Group Track Cycling Champs at Invercargill's ILT Velodrome this evening. 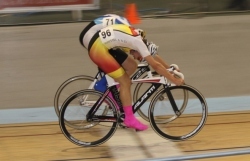 The Masters Women categories provided two new National Records. Jacq Dearlove again lowered her National mark for the Category 2 500m Time Trial to 39.213 to claim gold. Megan Blatchford-Peck of West Coast North Island took silver while Marie Muhl's personal best took her to bronze. In Category 1 the pace was even quicker. Kylea Gough throw down the challenge by breaking Erin Criglington's national record in her ride, registering a 38.975 - the first time a Masters Woman had broken the 39 second barrier. But her Southland teammate rose to the occassion and shaved another 0.2 seconds of Goughs time to set a new low mark of 38.738 and take gold. Earlier Southland fought back strongly to push Auckland all the way in the Under 17 Girls 2000m Team Pursuit Final. In the end Auckland held out Laura Heywood, Jen Muhl and Brooke Brazier by half a second to claim gold. The boys combination of Michael Culling, Josh Haggerty, Jeremy Presbury and Liam Aitcheson were not to be denied however as they overtook Mid South Canterbury on their final lap to grab a deserving gold medal. In the Under 15 200m Derby Finals, Amanda Rowe (Waikato.Bay of Plenty) took out the girls event while Southland's Liam Haggerty proved too strong in the Boys. The Masters Men categories also handed out their Time Trial medals tonight. Auckland's Scott Russell set a blistering 35.831 for his 500m to win gold from Southland's Colin Horton by 3.5 seconds. Southland narrowly missed out on a rare trifecta in the Cat 2 TT, with East Coast's Kerry Harford spoiling the party by finishing second. Roger Nicholas took gold with 36.845 from Harford with Richard Eade snaring bronze. Meanwhile the Cat 1 final was a beauty, coming down to the final ride by Southland's Michael White and Waikato/Bay of Plenty's Manu Robson. The two have been closely matched over recent championships, but Robson could only manage bronze, while White exploded from the gate and was always ahead of where he needed to be to secure a deserved national title. Otago's Chris Henderson claimed silver. The upset of the night came in the Women's U19 Keirin when Steph McKenzie, who has been untouchable up to this point, sufferred a rare (if narrow) defeat at the hands of Auckland's Paige Paterson. Kate Dunlevey continued her fine championships by earning another bronze medal. The Men's event was one by powerful Tasman rider Daniel Ellison. The U19 Omniums continued with Elimination races and Southland's Sophie Williamson controlled her ride brilliantly to make it two wins from as many events to open up a three point lead a the top of the standings from West Coast North Island's Cassie Cameron. The Men's Omnium is tied with Dylan Kennett (Canterbury) and Southland's Tom Beadle together on 4 points each. That's after Fraser Gough won the Men's Elimination from Beadle, with Kennett in third. Two spectacular distance events ended tonight's programme. The Under 17 Girls Points Race came down to the final sprint of the night with Waikato Bay of Plenty's Robin Hacker-Cary adding another title to her increasing resume. Jen Muhl finished with silver with Auckland's Devon Hiley taking bronze. 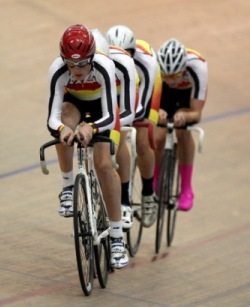 And the Under 17 Boys Scratch race came down to a photo finish. That's after Waikato Bay of Plenty's Blair Treymane had earlier broken free of the bunch in search of a solo win and had ridden bravely by himself for much of the race, before being reeled in on the final lap. In a bunch finsih, Michael Culling kept his unblemished U17 record in tact with a wheel width win over Auckland's Chad Elliston with Regan Gough from East Coast third. All of this also meant that the Points Shield is increasingly looking safe in Invercargill as Southland pushed through the 100 points barrier. It ended the night with 109 points, well clear of its closest rival, Auckland, on 41. The Age Group Champs continue through until Saturday with sessions starting each day at 10am and 6.30pm. Full results can be found here along with the daily Photo Gallery and archive Text Commentary.